My family insists they’ve NEVER had better baked beans than these! Here it is…my most requested recipe! Wherever I go, I’m asked to bring the baked beans. Every family get-together I ask “What can I bring?” and they ALWAYS say “Your baked beans”. Oddly enough, this is one of my easiest recipes. If you’d like to try the very BEST baked beans you’ve ever eaten DO NOT– I repeat– DO NOT substitute any ingredients in this recipe! INGREDIENTS: DO NOT SUBSTITUTE ANY OTHER BRANDS! Cut bacon into 1″ pieces. Brown bacon and chopped onions in large skillet on the stove. Make sure the bacon is completely browned, but not burned. DO NOT DRAIN!!!!! Combine cooked bacon and onions (with their grease) with the rest of the ingredients in a large “oven-safe” pot. Cover and bake in the oven at 350 degrees for 2-3 hours. I’ve been told that this tastes best when eaten the next day after being refrigerated and reheated. TIPS: I usually double or triple this recipe every time I make it because it is in such high demand. You can also make this up the day before an event and reheat it in a crock pot on low. 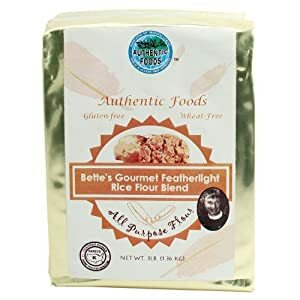 I have a link on the right-hand sidebar of this site for the beans- if they are not available in your local grocery store. I was given this recipe by a co-worker over 30 years ago. I made it and everyone went NUTS over it! The original person that gave me the recipe even asked me why mine tasted better than hers. I didn’t know…because I’d never eaten it. The fact is, I don’t like baked beans…AT ALL! When I was growing up, I had a saying, “I don’t like any kind of beans–except jelly beans!”. Over the years, my relatives would make this recipe and love it but still ask me why mine tasted better than theirs. I FINALLY figured out the reason. I always used the B&M Original Baked Beans while my family and friends substituted “other” brands. 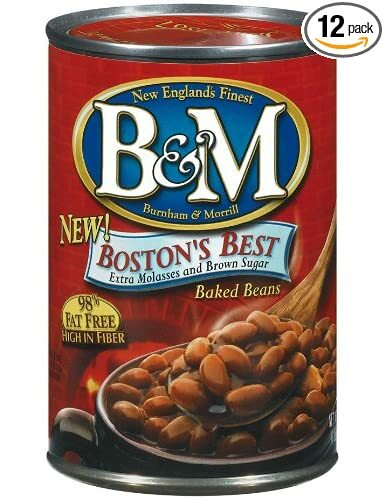 The B&M brand is a “small pea bean” rather than the white or red kidney bean. You HAVE to use the B&M Original or Boston’s Best Baked Beans to make this recipe work. My family insists that these are the best baked beans they have EVER, EVER had!!! So much so, that my daughter has requested that my baked beans are a MUST for her graduation open house. P.S. 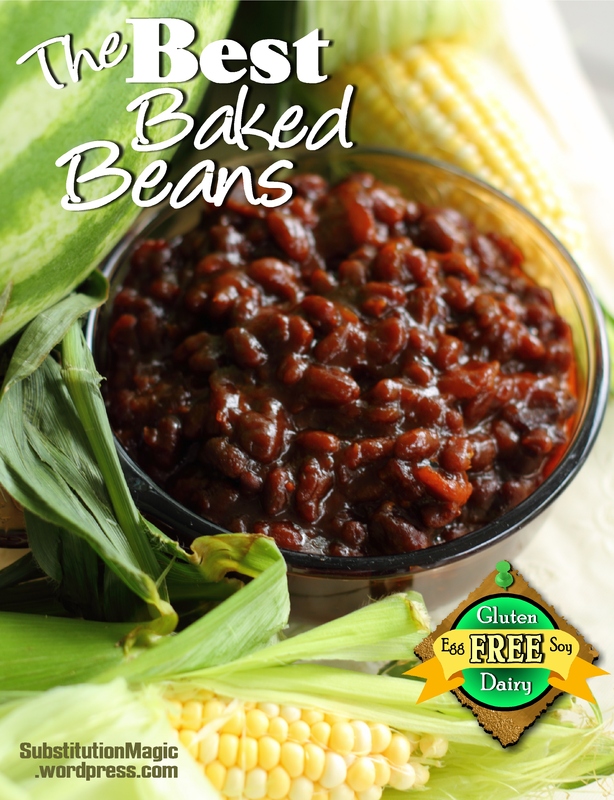 All of the B&M brand baked beans are gluten-free (according to their website). Some of B&M brand varieties contain soy ingredients. The most recent time I made this recipe, the “Boston’s Best” variety didn’t contain soy. In the past, the “Original” variety contained soy, but the ingredients on their website didn’t have soy listed for the “Original”. Check the can for the most current list of ingredients. So, I’m making these right now and I followed the recipe to the letter and they are soupy. Not thickening. Any suggestions? I have left them in the oven for an extra hour and still not thick like your photo. They will thicken up as they cool a bit. So don’t worry about it too much. Just keep mixing them up with a large spoon so that the grease integrates with the beans. 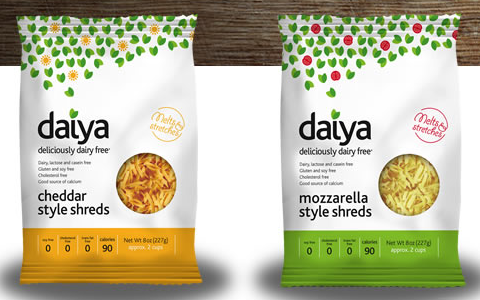 They are actually better texture-wise and taste-wise the next day after being refrigerated overnight and reheated. Let me know how they turn out…thanks! You’re really doing everything you need to actually make a batch from scratch. Pick up a bag of dry beans, soak them, adjust your ingredients a little and throw them in a slow-cooker. They will be better than yours.